Marine Corps Base Hawaii Kaneohe Bay is fondly referred to as K-Bay. It is located on the island of Oahu's Windward side on Mokapu Peninsula, and is 20 miles northeast of the Honolulu International Airport. 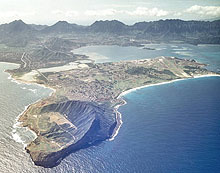 K-Bay is the largest Marine Corps element on Oahu. The other major installation comprising MCBH is Camp H.M. Smith, overlooking Pearl Harbor.